Listening to metaphors involving arms or legs loops in a region of the brain responsible for visual perception of those body parts, scientists have discovered. The finding, recently published in Brain & Language, is another example of how neuroscience studies are providing evidence for “grounded cognition” – the idea that comprehension of abstract concepts in the brain is built upon concrete experiences, a proposal whose history extends back millennia to Aristotle. The EBA was shown in 2001 to respond selectively to images of the human body by Nancy Kanwisher and colleagues. 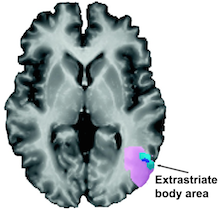 When study participants heard sentences that included phrases such as “shoulder responsibility,” “foot the bill” or “twist my arm”, they tended to engage a region of the brain called the left extrastriate body area or EBA. The same level of activation was not seen when participants heard literal sentences containing phrases with a similar meaning, such as “take responsibility” or “pay the bill.” The study included 12 right-handed, English-speaking people, and blood flow in their brains was monitored by functional MRI (magnetic resonance imaging). Just before Thanksgiving, Slate writer Katy Waldman hadÂ a piece summarizing theÂ growing body of evidenceÂ thatÂ linguistic metaphors reflect how we actually use our brains. Emory neuroscientist Krish Sathian and his colleagues have been major contributors to thisÂ field (“conceptual metaphor theory”). In 2012, he and Simon LaceyÂ published their brain imaging study, which found thatÂ when peopleÂ listened to sentences involving touch metaphors (“havingÂ a rough day”), the parts of the brain involved in the sense of touch were activated. NPR’s Jon Hamilton talked about these findings with him in 2013. At the recent Society for Neuroscience meeting, Sathian discussed his team’s ongoing work on how the brain processes metaphors that make references to body parts (head, face, arm, hand, leg, foot), as part of a nano symposium on language.